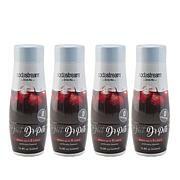 Tantalize your tastebuds with this assortment of flavors for your SodaStream carbonated water maker. Make any day the perfect time to enjoy the taste of classics you know and love - without the guilt of the calories. Ingredients: Water, Caramel Coloring, Phosphoric Acid, Natural Flavor, Citric Acid, Acesulfame Potassium, Caffeine, Sucralose, Tri Sodium Citrate. 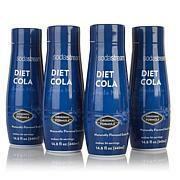 Ingredients: Water, Artificial Flavors, Caramel Coloring, Phosphoric Acid, Sucralose, Caffeine, Sodium Benzoate (as preservative). Ingredients: Water, Citric Acid, Tri Sodium Citrate, Aceselfame Potassium, Acacia Gum, Sucralose, Glyceral Ester of Wood Rosins, Natural Flavor, Sodium Benzoate (as preservative), Yellow No. 6, Beta- Carotene, Red No. 40. Ingredients: Water, Caramel Coloring, Natural & Artificial Flavors, Citric Acid, Acesulfame Potassium, Acacia Gum, Sucralose, Sodium Benzoate (as preservative). Great product. I have being using Sodastream for years. Love the variety pack, and availability from HSN. Smart. Sparkly. SodaStream. Turn regular water into soda in seconds with this innovative and economical alternative to bottled beverages. 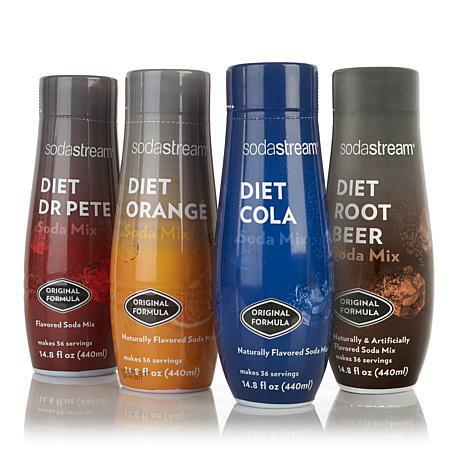 Featuring hundreds of fantastic flavors and the ability to personalize and perfect every drink, SodaSteam is fizzy fun for the whole family.